It’s finally here! Collaborate with your team, manage opportunities, and gain insight into your sales workflow right alongside your talent pipelines. Built on the same platform as our Job Dashboard, the new sales workflow is fully customizable and can be configured to let you see what you want, how you want. We’ve worked hard to make the new sales feature intuitive, seamless and flexible. To do this, we’ve combined industry standard concepts such as Leads with our more fluid concept of an Opportunity.Lead – This is the top of any sales funnel and represents potential your sales team is pursuing. It might be nothing more than a name and contact info. Leads can be worked and nurtured until they are ready to become a full Opportunity that is ready for candidates.Opportunity – Once a lead is qualified through your lead process, it transitions to a full Opportunity. The details of the opportunity should be known at this point. The type of opportunity is identified, a job, a project, a new retainer or a single placement? The type of opportunity should align with how your organization sells, packages or delivers its services. With the details known, potential value can also be calculated and recruiters can start working the talent pipeline. Note: It is important to note that the term ‘Opportunity’ can be used to address different types of opportunities. For example, a job and a search are both opportunities. Placement/Loss/Other – Once an opportunity makes its way through your process, it’s completed this can be positive like a Placement, negative like a Loss or some other type that you customize for your workflow. NEW – Leads – The top of your funnel, capture basic information, work them through customizable qualification stages and when ready, optionally make them available to your recruiting team. NEW – Opportunities (Jobs) – Once qualified, leads can become Opportunities for Jobs. This represents an open search or placement workflow and is identical to the existing Job management experience in Crelate today. We’ve added new capabilities to Opportunities of all types, including tracking potential and expected value, as well as probability. NEW – On-Hold – You can now place Leads and Opportunities “on hold”. By default, this will hide them from your active sales and recruiting dashboards. This can be done without having to change a record’s stage or disposition. When ready you can simply remove the hold status and pick up where you left off. NEW – Priority – The new Sales Tab gives you a view of your entire sales process, all on one page. By default, organizations will have four sales stages (which are customizable of course) – New Leads, In Progress, Filled, and Lost. Existing customers will see their Job Status migrated into Sales Stages. 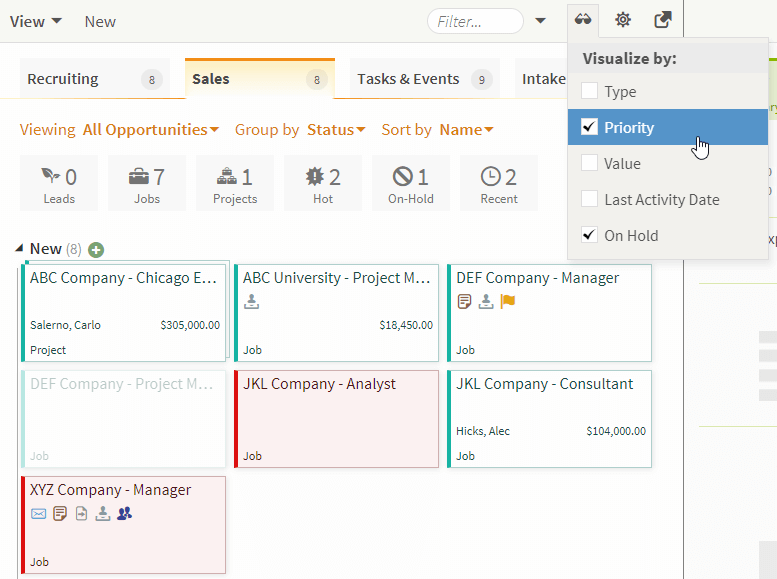 This view is fully customizable just like our existing Recruiting and Job dashboards. Configure group by, filters, sorting and other details as you see fit. NEW – Sales Tab – The new Sales Tab gives you a view of your entire sales process, all on one page. By default, organizations will have four sales stages (which are customizable of course) – New Leads, In Progress, Filled, and Lost. Existing customers will see their Job Status migrated into Sales Stages. This view is fully customizable just like our existing Recruiting and Job dashboards. Configure group by, filters, sorting and other details as you see fit. NEW – Sales Board Views – Several different ways to view the sales board are available (all show opportunities but with different filters and layouts). Views include: all opportunities, view for each opportunity type, my opportunities view, and the ability to create custom views. NEW – Sales Charts – When the summary tab is selected, several new charts are displayed. Charts include: expected value per stage, historical comparisons, expected and potential value, average time in stage, time to close, value won over time, fall-off charts, and activity counts. NEWPREMIUM – Customizable Opportunity Types – Premium customers can now default multiple custom types of opportunities to track. Each opportunity type has its own customizable form. NEWPREMIUM – Opportunity Groups (Projects) – Premium customers can also group opportunities together and track them as a unit. For example, you might track the potential to make multiple placements if you win the overall opportunity. NEWPREMIUM – Sales Only Opportunities – When an opportunity results in something other than a job or talent search, you might use a sales-only opportunity. This is a new type of opportunity that can be used to track your sales process around landing a new account, without a specific deal or placement in mind. NEW – Basic Opportunity Valuation – Track financial value of Opportunities. This setting controls how the ‘Potential Value’ and ‘Actual Value’ fields on the opportunity behave. Value fields are plain input fields that accept a single dollar value. Fee-based -Values – a value field can be opened to a potential value dialogue, where you can type in salary, fee, fee %, and a discount, and the value is calculated based on a formula of: Salary * Fee % + Fee – Discount. The Custom setting gives you the ability to define your own custom form to use as the ‘potential value’ dialog. Picked fields are shown in the dialog and use a custom formula to calculate potential value. NEWPREMIUM – Advanced Opportunity Valuations – Premium customers can move beyond basic value calculations with a fully customizable valuation form; including custom calculated. NEWPREMIUM – Calculated Fields – Used on the opportunity + placement forms, the value of one field can be used to automatically calculate the value of another to help save you time! NEW – Placement Activity – The concept of Placements has been added as a new activity type. When creating placements, you will have the ability to add in details like start date, salary, bonus opportunities, and so on. NEW – Placement Reports – Reports – Placement reports will be able to be viewed by: all placements, individual users, companies, and opportunities. 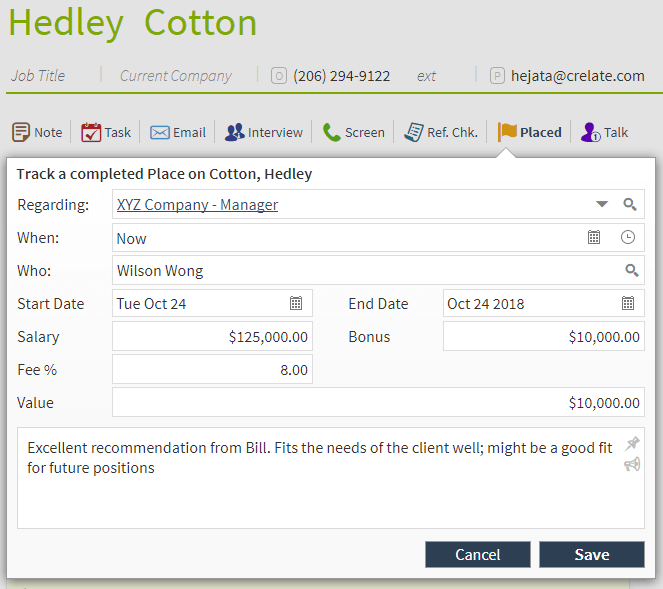 NEWPREMIUM – Placement Customization – Premium customers will be able to customize their placement forms, including being able to define custom calculations to use when recording the value of a placement. NEW – Loss Activity – If Opportunities aren’t won you have the ability to note and track the reasons. Also, users can customize the lost reason form and add custom fields to it. NEW – Import Leads from Excel – We’ve updated our import from Excel wizard to support the creation of new Leads! NEW – Sales/Client Contact Lookup – We’ve added a new category of ‘Related Contact’ on opportunities called “Sales/Client Contact”. This is also now the default related contact category). Any contact that is set as a related contact on any Job or Opportunity will automatically have its record type set to “Sales/Client Contact”. Any contact that is set as a related contact on a Lead will be automatically set as a Lead Contact when the lead is converted to an Opportunity. CHANGED – Job Status is now Sales Stage – Jobs no longer have a “Job Status”. Now all just have a ‘sales stage’ on the sales workflow. Existing Job Statuses will be converted to Sales Stages. CHANGEDPREMIUM – Employment Search Changes – For all new customers, Employment Searches are now a premium only feature. (don’t worry-if you were using them before as a professional user, you’ll still have access). Employment Searches, sometimes referred to as “Most Placeable Candidate” or Candidate-centric workflows, are now a custom Opportunity type. To make room for the new Sales Dashboard and visualizations, the Crelate home page and existing job dashboards are getting a bunch of updates. Upgrade Note: Existing job board views and filters will be preserved during the upgrade but users should take note that a few options have moved around. NEW – Fully customizable Recruitment Dashboard – The home page view now gets a wide range of additional customization capabilities. CHANGED – Homepage Tabs – Tabs on the Homepage now include: Recruiting, Sales, Tasks and Events, and Intake. The tabs show total number of opportunities along with total leads. The Sales tab also shows all opportunities in the organization. CHANGED – New Recruiting Tab on Homepage – The Jobs tab has been renamed to Recruiting and has been redesigned to include all of the same customization features as the Sales Tab, including custom views, filters, and visualizations. CHANGED – Count Changes – We changed the way quick filter counts at the top of the Crelate dashboards are calculated. The Activity tiles on the job board are now based on the number of candidates that have the respective activity; instead of just a raw count of activities. Customers have told us this is much more meaningful and this change also makes the counts more consistent with other areas of the app. We are really excited about our new visualizations capabilities. Our customers say that Crelate is a ‘report that you can work in’ and the new visualization features expand on that value. It is important that recruiters be as efficient as possible and visuals can go a long way to help with this. Our new visualizers allow users to dynamically change the color or style of the tiles on any of our workflow dashboard based on the value or state of the underlying record! To start, we’ve included four visualizers and will add more in the future. NEW – Color Visualizer – Users can set color of a tile based on value of a property. Color can be based on any lookup, number or date. Up to 20 different colors can be used. NEW – Fade-Out Visualizer – Users can fade out tiles that have a specified value (tile becomes semi-transparent). Fade-out visualizations can also be based on Boolean fields. NEW – Color Gradient Visualizer – Lets you color tiles based on a numeric or date value and the color changes in a continuous gradient based on value. 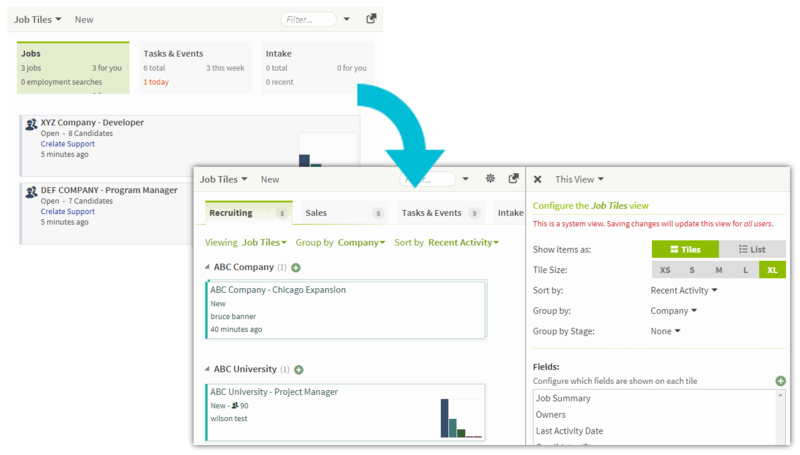 NEW – Custom Quick Filter – The quick filter tiles at the top of the Sales, Recruiting and Job Dashboards are now customizable! Crelate has added new portal features to provide a better experience for potential applicants and help you match more people to your jobs. Search will let candidates find jobs on your portal more easily along with our new location filter to categorize positions geographically. NEW – Portal Search – Ability to add a search bar on your portal page so applicants may quickly search through your job postings to find jobs that fit them best. NEW – Location Filtering – Ability to show location of opportunities so applicants can check out jobs based on their preferred locations. Note: This feature is OFF by default for existing customers, please see the Upgrade Impact Guide for instructions on how to enable. And a few more goodies… As always, this release has a wide array of other improvements based mostly on customer feedback and requests. NEW – Insert Image into Emails – Currently we allow copying and pasting images into emails, but we have a fairly small size limit to help keep the likelihood that the email will be marked as spam low. But what about when you really need to send a larger image? Fear not! We now allow you to insert images into an email body via a web url! This works for individual emails, bulk emails, and submittals. NEW – View Sales Board Privilege – Allows managers to configure whether users are allowed or not to view the Sales Board and create Leads. Professional users can configure this for all users and Premium customers can configure this on a role-by-role basis. NEWPREMIUM – Opportunity-Type Privileges – Each opportunity type (including custom ones) will have its own set of privileges. NEW – Last Engagement Date Field – New Field Added to Contacts and Jobs/Opportunities – This is like our “last activity date” field, but now the organization’s admin can customize which types of activities qualify as engagement. By default, this will be set whenever you receive an email from the candidate or customer. Administrators can configure custom Activities in Activity Settings – Users can configure which custom activities qualify as engagement for their organizations. NEW – Added Sub-Stages to Workflow – Ability to add one sub-stage to current workflow stages. NEW – Workflow Stage Rules Improvements – We’ve made the rule editor easier to use and updated it to support the new features of the Sales Workflow. IMPROVED – Activity/Stage Linking – We’ve enhanced the way activities and stages can be linked. Previously, if you configured a link between them, they were always bi-directional (For example: if you moved them to Placed it would create a Placement and vice versa), Now administrators can configure this to be only one directional. IMPROVED – Reminder Dialog Improvements – While it’s good to stay on top of appointments and tasks, we’ve recognized that the reminder dialog could be a little too prominent and break a user’s concentration and hinder productivity. We’ve taken steps to make the reminder a little softer, by making it appear in the bottom left corner and not steal focus. You can also minimize it if it is still in the way! IMPROVED – Responsive Navigation Bar – Screen size inflation in recent years have made pixels less of a commodity, but there are users in the other end of the spectrum that are sporting ultra portable laptops and need the most efficient use of their screens possible so we’ve made it so that shrinking the height of the browser will now shrink the navigation buttons so that the app remains usable at even the tiniest of screen resolutions! IMPROVED – Form Editor and Custom Fields – The user interface for Configuring Layouts has been improved, including the ability to create two new custom fields-including number and date field. IMPROVED – New UI for Company Statuses – The user interface used to edit company statuses has been re-designed. You can now see all statuses and sub-statuses in a single list instead of having separate lists. IMPROVED – Search/Find Company by Job Stage – We’ve added the ability to search and find all companies that have jobs and are in specific job stages (same filter in FIND as well). Unclear – needs clarification. IMPROVED – Search/Quotes to do Exact Searches – We have improved our Search functionalities to drill down and search exact matches to help save time. IMPROVED – Company Activity Roll-up – This is a very highly requested improvement! From your Company view, you can now see an aggregate activity stream across all jobs and opportunities for that company. ENGINEERING UPDATE – We’ve made a number of engineering and performance updates to our Search and Reporting servers. ENGINEERING UPDATE – We’ve improved our Resume Import Wizard to provide better feedback and faster performance during larger imports. ENGINEERING UPDATE – We’ve made a number of engineering improvements to our Bulk Mail features, allowing mails to be sent faster and making sent mail storage more efficient.